A Microsoft private cloud dramatically changes the way your business produces and consumes IT services by creating a layer of abstraction over your pooled IT resources. This allows your datacenter to offer true infrastructure service capability as well as optimally managed application services. Microsoft private cloud solutions are built on System Center and Windows Server. System Center 2012 Release Candidate empowers you with a common management toolset for your private and public cloud applications and services. System Center helps you confidently deliver IT as a Service for your business. Windows Server 2008 R2 SP1 (optional download) will give you improved powerful virtualization capabilities that can transform how you deliver IT services to your end users and enable you to lay the foundation of a private cloud infrastructure. 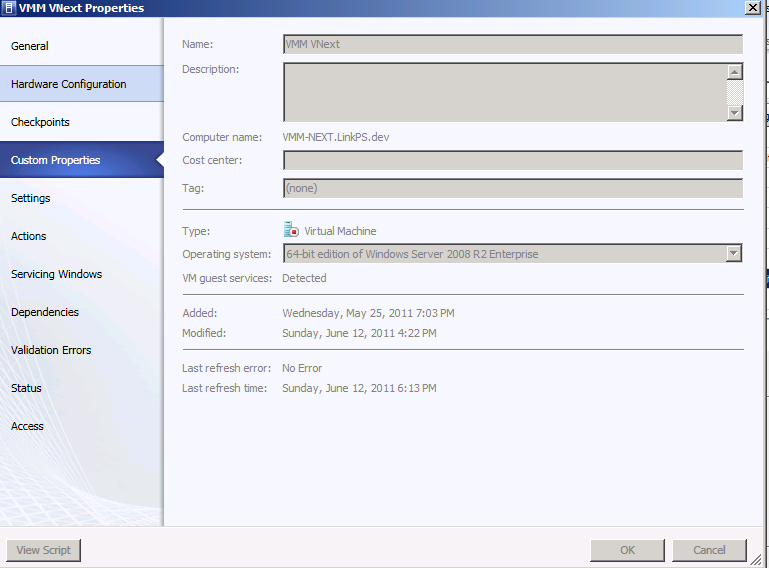 Please Note: Many Microsoft private cloud scenarios require Windows Server 2008 R2 SP1. If you are using an older version, we highly recommend upgrading to experience the full Microsoft private cloud evaluation. Need more information? See the product details page. Register to access technical product resources at the Microsoft Private Cloud Evaluation Resource Page. System Center 2012 Operations Manager provides deep application diagnostics and infrastructure monitoring that can help you ensure the predictable performance and availability of vital applications and offers a comprehensive view of your datacenter, private, and public clouds. Windows Server 2008 R2 SP1 is designed to help you increase control, availability, and flexibility of your datacenter and desktop infrastructure while helping reduce costs. Deliver flexible and cost effective Infrastructure as a Service (IaaS). You can pool and dynamically allocate virtualized datacenter resources (compute, network, and storage) enabling self-service infrastructure experience for your business, with flexible role based delegation and access control. Apply cloud principles to provisioning and servicing your datacenter applications with techniques like service modeling, service configuration and image based management. You can also state-separate your applications and services from the underlying infrastructure using server application virtualization. This results in a “service centric” approach to management where you manage the application or service lifecycle and not just datacenter infrastructure or virtual machines. Optimize your existing investments by managing multi-hypervisor environments, including Hyper-V, Xen and VMware. Dynamic optimization of your datacenter resources based on workload demands, while ensuring reliable service delivery with features like high availability. Best-of-breed virtualization-management for Microsoft workloads like Exchange and Sharepoint. Build your Private Cloud today; provision flexible, agile and cost effective IaaS while maintaining your quality of service (QoS) commitments to the business. Manage heterogeneous virtual environments using a single tool, thus optimizing your existing datacenter investments. Optimize your existing applications for private cloud deployment without requiring you to rewrite them from scratch. Dramatically simplify application provisioning and servicing thus saving operational effort and expense. Unlock application mobility between your cloud environments as appropriate to your business needs. 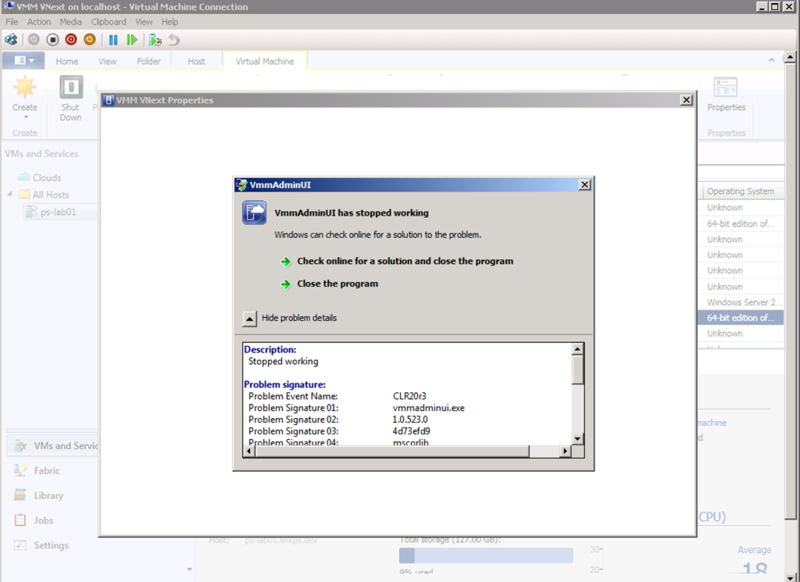 This happens for VMs running on Hyper-V Windows 2008 R2 SP1..this host used to be managed by VMM 2008 R2 SP1..then I removed the agent and installed VMM 2012 Agent. hvredevoort wrote a very interesting post about VMM VNext and I through it is important to be shared. During the MMS2010 keynote of Bob Muglia, Edwin Yuen showed a glimpse of SCVMM vNext. The short demo presented a very interesting view ahead of what a complete virtual management solution looks like. Next to the familiar categories like Hosts, Virtual Machines, Library, Jobs and Administration a few new categories were visible: Datacenter, Network and Storage. Apparently these will be the new building blocks in the deployment of virtual machines and most likely also Hyper-V hosts. Along with Server App-V to deploy server apps to running virtual servers. By means of a model/template objects were dragged and dropped to define a new service/server combination. 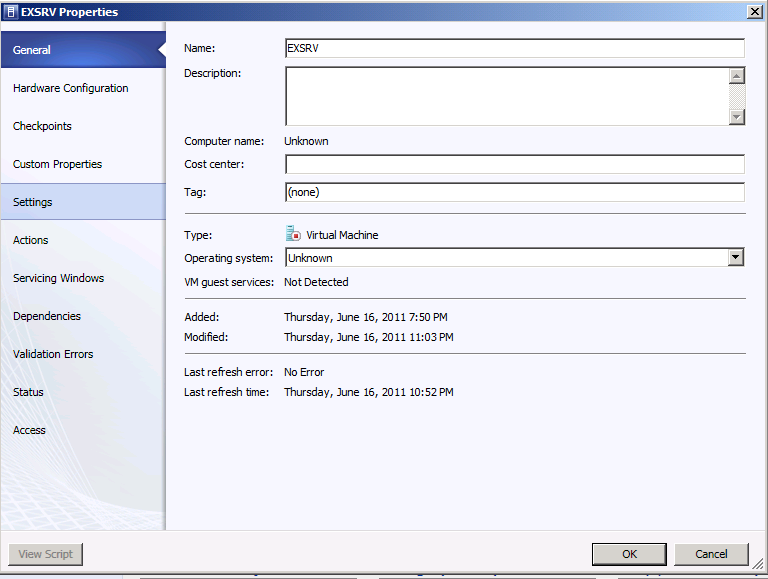 Also the concept of the private cloud and the public cloud is translated in the user interface of SCVMM vNext. In the top lefthand corner, we can now see a new light blue (azure?) container with several private clouds as well as a hosted cloud. As I wrote earlier, we can expect to move servers and services between the two clouds. SCVMM vNext will support Virtual Sever, Hyper-V R1, Hyper-V R2, Xen and VMware. By the time the product is ready it will probably also support the latest incarnation of Hyper-V, if it still listens to that name in 2011/2012. For a System Center roadmap see my previous blog. This translates to faster time to market for solutions, and a great enabler for the business. Part of the cost savings is done by means of scale of buying and using server hardware. As I wrote in my blog http://hyper-v.nu/blogs/hans/?p=159, the new server form factor for the cloud is the container. A picture was shown of how Microsoft gets its servers delivered: by the thousands and ready-to-go on delivery.